Based on the description of Mr. Joe Morrison by other toy industry contacts there was an expectation that he would be disinterested, short, and not very helpful. This impression turned out to be utterly false. Joe was gracious, knowledgeable, helpful, and very succinct. In fact, his communication style is very similar to individuals with very high cognitive scores. He was able to impart a large amount of data through minimal effort and words. He shared that he had started with Mattel in 1978. His role had been within the Marketing department during his early days with Mattel. During that time he worked with Bandai on several projects, which made the Mattel/Bandai partnership for M.U.S.C.L.E. nothing new to him. However, before he worked with Bandai on M.U.S.C.L.E. toys his focus was on He-Man and the Masters of the Universe. His involvement with He-Man started when Mattel started researching three different themes for a new action figure brand. The end result was the product that consumers know as He-Man. Around 1983 Joe’s career shifted to Licensing and TV, but by around 1985 he had become the Executive Vice President of Marketing at Mattel. Joe was now responsible for Marketing and it was Marketing that drove Mattel. There has often been a feeling that changes in advertising and cartoons in the early to mid-1980’ greatly impacted the toy industry. Interestingly Joe did not feel that deregulation of advertising aimed at children and Bernard Loomis’ “creation” of Saturday morning cartoons caused any changes in the toy industry. He felt that toys had always been a fashionable industry, driven by advertisers. As Joe became the Executive Vice President of Marketing at Mattel M.U.S.C.L.E. was ready to launch. When asked about its status as a flanker brand he sounded a bit surprised. He stated he never felt that M.U.S.C.L.E. had started out as a flanker brand. He always saw it as a brand of small collectible figures. He also felt the success of M.U.S.C.L.E. made it difficult to describe the brand as a flanker. Joe was especially proud of the advertising that had accompanied M.U.S.C.L.E. toys. He felt the work of Ogilvy & Mather was an especially clever version of marketing small collectible figures. In fact, the M.U.S.C.L.E. commercials were the most successful campaign for Mattel that year. Joe was also able to end a very long standing debate. The figures used in the advertising were indeed the Japanese Kinnikuman figures. 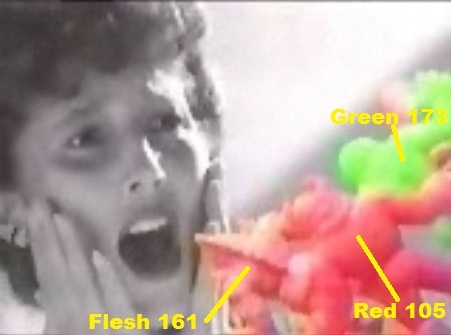 However, the color figures for the third commercial were 100% unique. They were special M.U.S.C.L.E. 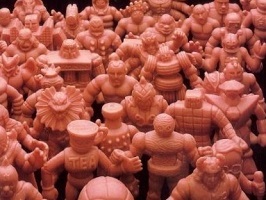 figures, created by Bandai, to be used in the third M.U.S.C.L.E. commercial. Joe was a wealth of knowledge when it came to the M.U.S.C.L.E. figures. He stated that Mattel had never ordered an internal or external recall of any M.U.S.C.L.E. figures nor had they discontinued any figures because of safety reasons. The figures that were selected for the M.U.S.C.L.E. brand were the result of conversations between Marketing and Operations. He implied that Marketing had their initial figure choices, but that Operations saw the selections from a strictly logistical perspective. It was Operations that was responsible for insuring that the packages had the correct figures and that the cases shipped to retailers had the correct assortments and varieties. As an example, Joe stated that Mattel may have wanted 12 different combinations in a “flat.” It was up to Operations to ensure the figure selection allowed for Bandai to create and package 12 different combinations in a case. The most surprising information was regarding the Non-Poster M.U.S.C.L.E. figures. Joe stated that retailers that placed significant orders received special figures. For example, if Toys R’ Us order 100 cases of 4-packs then they would not only receive a discount but also a special figure(s). Joe stated that these figures would not have been advertised because they could not be advertised nationally. The demise of M.U.S.C.L.E. seemed to perfectly coincide with the introduction of Nintendo and the reduction in Mattel’s brand offerings. Joe did not feel that Nintendo had been a contributing factor to the cancellation of the M.U.S.C.L.E. brand. He stated that the Boys Action Figures market is and was driven by television and movies. The lack of those two branding tools certainly created additional hurdles for the M.U.S.C.L.E. brand. M.U.S.C.L.E. may have ended, but Joe’s involvement with small collectible action figures did not. Joe created and sold Monster In My Pocket to Matchbox. Joe stated that the Monster In My Pocket brand struggled more in the United States because it got lost in the struggles of Matchbox’s financial challenges. Matchbox was sold to Tyco and then to Mattel over the course of roughly seven years. Joe attributed the far greater success of the Monster In My Pocket brand in Europe to the strength and commitment of the distributors in Europe. He stated the strength of those distributors was also the reason that the Monster In My Pocket re-launch was far more successful outside of the United States – specifically in Europe. Any person that has ever enjoyed playing with a M.U.S.C.L.E. figures certainly owes Joe Morrison a tremendous thank you. M.U.S.C.L.E. collectors specifically owe Joe an even greater thank you for shepherding the M.U.S.C.L.E. brand to success and for taking the time to share his insights. Joe’s insights are numerous. The implications from the information he shared are profound. The impact of Joe’s interview is fully explored as the second part of Archeology 400 – The Implications. This entry was posted on Wednesday, May 25th, 2011 and is filed under Archeology, Research, UofM News. You can follow any responses to this entry through RSS 2.0. You can skip to the end and leave a response. Pinging is currently not allowed. Very nice article Chad. Pretty much solved the SR theory with special figures being given to stores that ordered a lot. The Non-Poster figures may still have some question marks. That’s why I have a second part of Archeology 400 – The Implications. There are still some things to think about. Absolutely amazing! Incredible work Chad. This is one of the greatest moments in M.U.S.C.L.E. collecting history. What did you have to do to get the interview set up? Great detective work ~ bravo! What I think is weird that the idea of SRs existed because they were specially sent out to stores who bought a lot was never thought of by our community. I think I’m right on that. If not, please correct me. Interested in what Archeology 400 will say. wow, how amazing! I think that was the best read I’ve ever had.. I am so energized, I love the fact that you were able to make this happen.. Bravo! So super rares are just thank yous. Works for me! I think it would be nice to know what is up with the poster on the box mail away offer. Nice job. Mattel was also just on WWE Live Chat answering questions last week! Chad, you never did put up the second part to this, or at least didn’t fix the link. You’re right. Part 2 was up, but the link here was broken. I’ve made the fix. Thanks! Archeology 400 - Joe Morrison Interview (Mr. M.U.S.C.L.E.) | University of M.U.S.C.L.E.